The Conciliation Hall built as a meeting place for Daniel O’Connell’s Loyal National Repeal Association. In 1897, it was rebuilt as a concert hall by W.H. 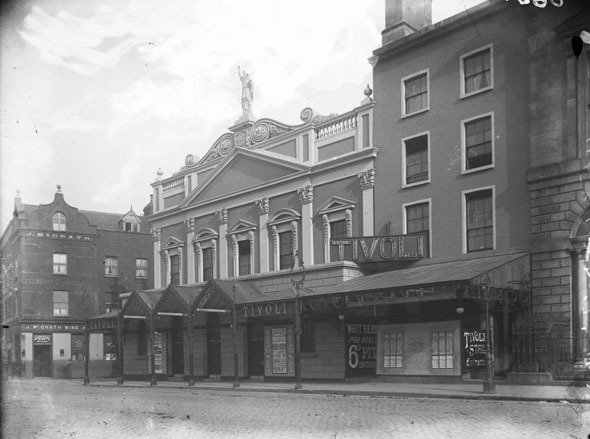 Byrne called the Grand Lyric Hall, later becoming known as the Tivoli in 1901. As can be seen in the illustrations, the facade remained largely the same, albeit with a large cast iron canopy at street level. A modest sized music hal, it seated 1252 patrons. The Tivoli closed in 1928 and the building converted to became the home of the Irish Press newspaper group.